Cloud Backup Advanced is a backup and replication solution fully managed by phoenixNAP. This service includes all of the capabilities of our Cloud Backup Standard offering, with support for off premises installations and backup encryption. With our Advanced solution you get VIP access to our knowledgeable technical staff, who act as your outsourced team – so you can focus on business and not on IT. 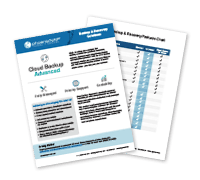 Save the time and money it takes to manage your own redundant backup tasks with this fully managed option.